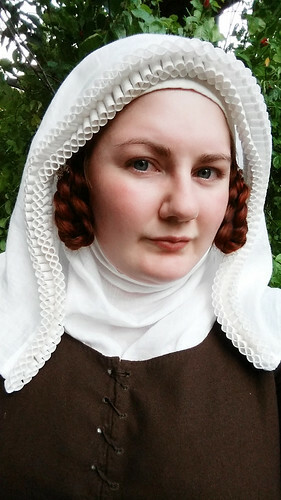 As I am in the progress of making a new shirt to my 16th century German dress, I also needed a new steuchlein to wear over my wulsthaube since my old one is in raw silk just as my old shirt. And here is how I make my steuchlein complete with a pattern diagram. 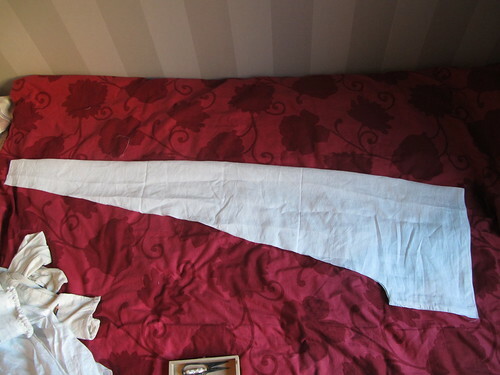 So here is my pattern, I put the long side against the fold of the fabric and that is also the reason that my steuchlein is 150 cm long. 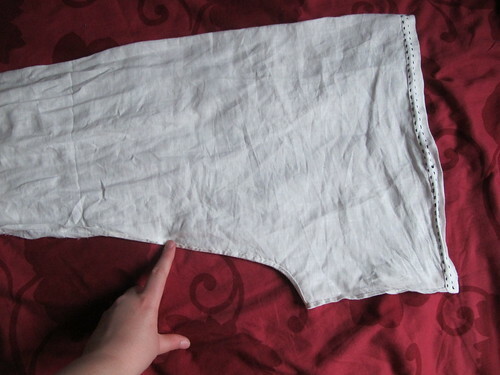 I use the width of the fabric. In the end it is mostly like a liripipe pattern, but without the cape part. 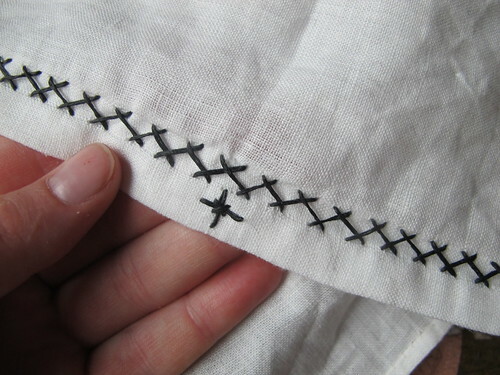 I use a thin linen fabric from medeltidsmode.se and sew with silk thread, because I like it and I find that the linen thread I have is a bit to thick for this fabric. 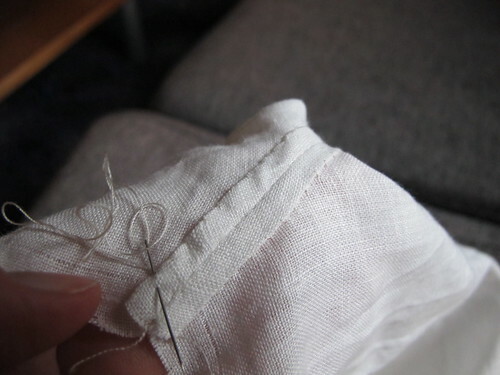 Start with hemming the end of the end of the tail, I cut my selvage away here, since I do not think it is that pretty and hemming with that gets so bulky. 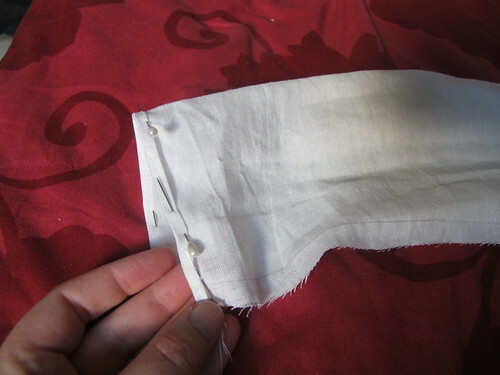 If you have nice selvage you can just ignore the hemming part and use the selvage as it is instead. 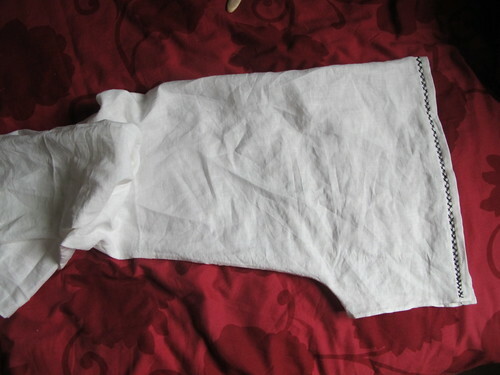 Then I sew the long seam that forms the tail part. 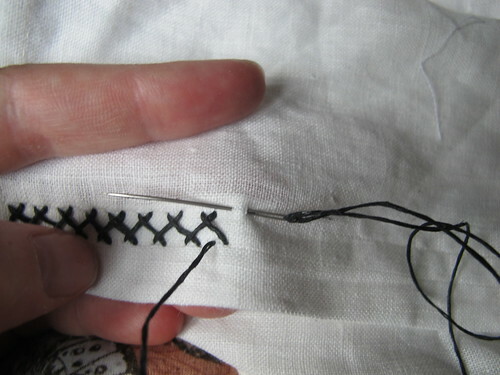 I sew with small running stitches, using backstitch here is in my eyes just a waste of time since there is not any strain on this seam. 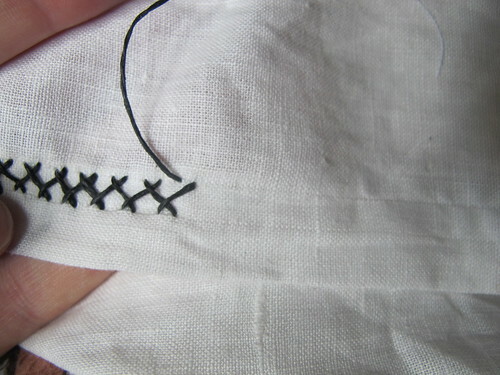 Running stitches will work just as good. Then I scrape the seams so that they lie flat. 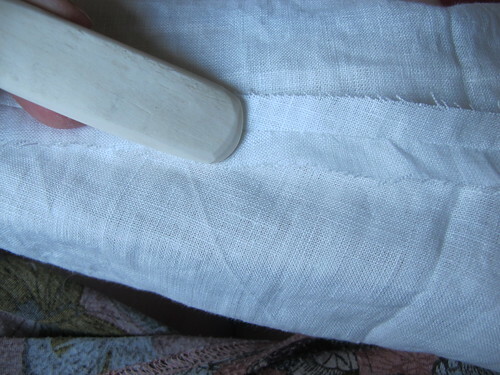 This is a period way of getting your seams smooth without ironing them. This is a bone tool that I use when I work with leather, but you can use whatever you like tree, bone your fingernails. 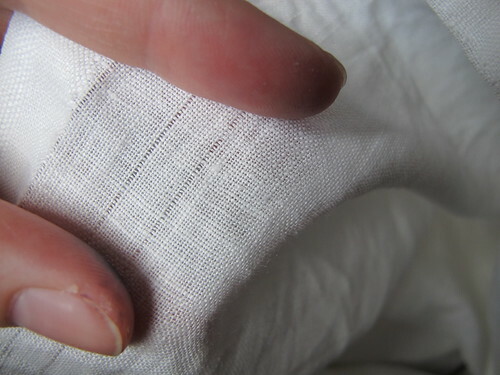 I use my fingernails when I scrape my hems. 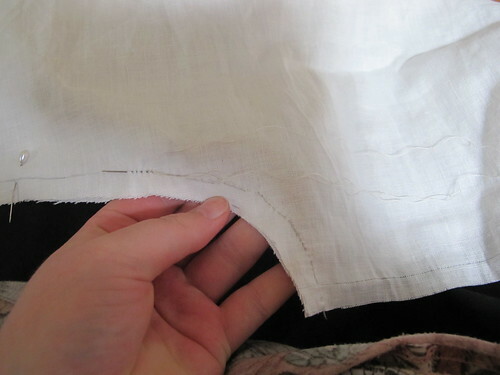 In the end of the tail, I fold in the raw edges and sew a bit. So that no loose threads will poke out. Then I fell the seams. Not all the way since most of the seam allowances is in the tail part so that felling those would be a waste of time since they do not get any wear or is ever seen. 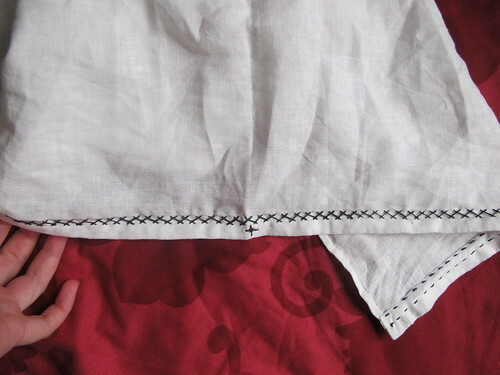 The fabric is also cut slightly on bias here, so the edges will not really fray here anyway. 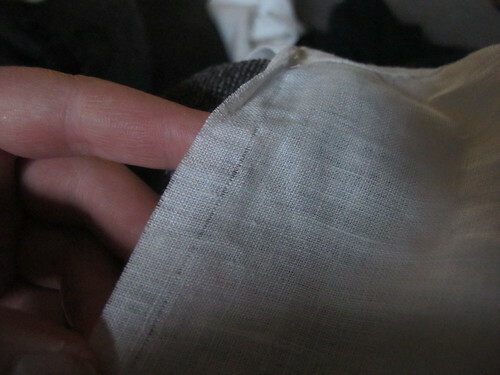 Then I hem the bottom part. 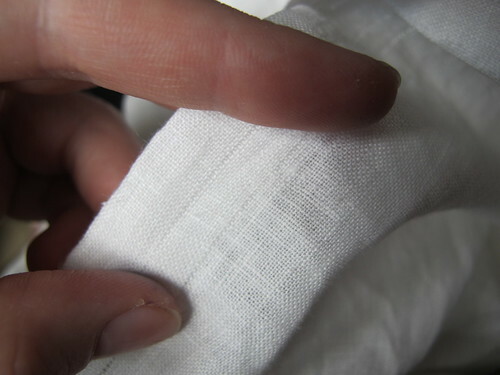 As you can see here, when working in linen fabric I like to pull out threads to know where my fold lines are. This ensures that the edges are 100% on straight grain. 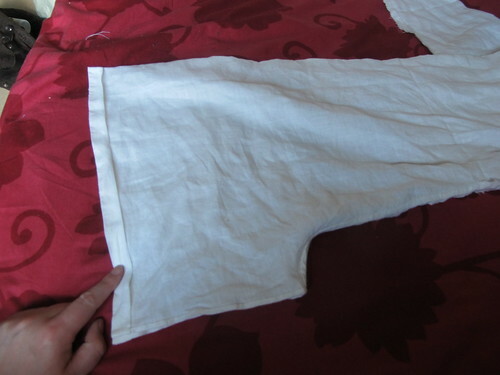 My hems are double folded and when finished 0,5 cm wide, thin and nice. 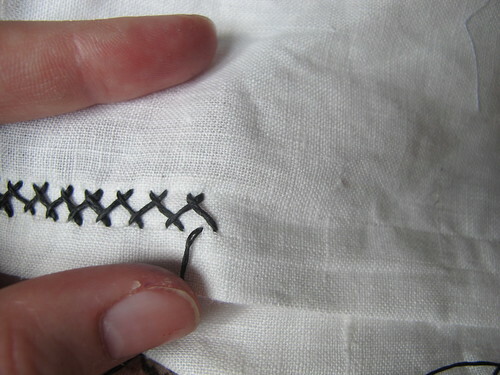 Then it is time to hem the front of the steuchlein, I pull threads here as well, to know where to fold. 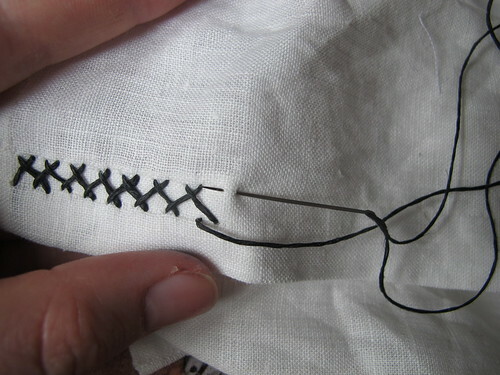 I am going to hem it with a embroidery stitch, so I pull two more threads out to guide my stitches. Fold the front in, scrape the edge to make it flat. 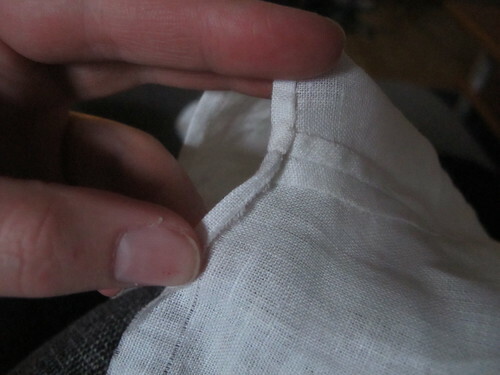 Here I have a single fold hem, using the selvage. Since it will not be seen and helps holding the front together. If you want to you can just hem it as it is now and then you are done. 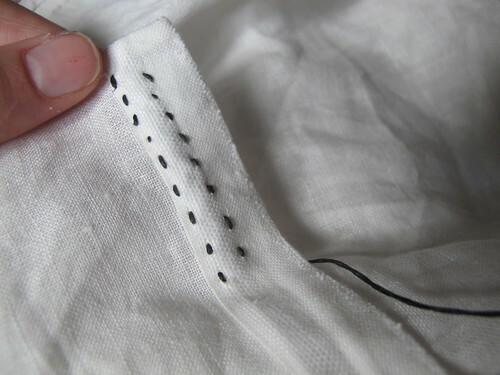 But as my new shirt is with black embroidery I want to use the same thread on my steuchlein as well. So I decided to hem with a herringbone stitch. So here are some pictures to explain the stitches. 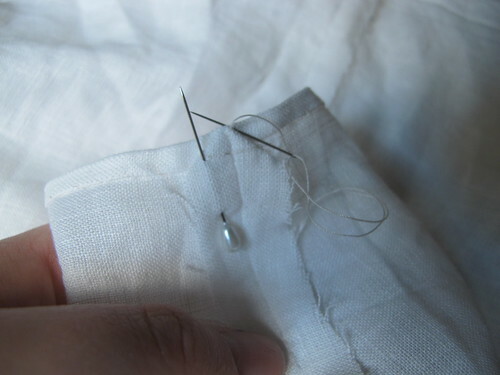 I sew with a thread that is slightly waxed to make it easy to sew with. 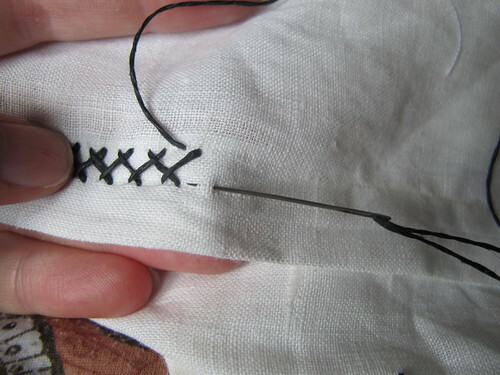 Here you can understand how it helps to pull out those threads. The embroidery is the exactly the same height all over. On the back it looks like this. I made a star it the centre front, to make it easier to put on right. With this steuchlein you can make a lot of different styles very easy. Great tutorial. What is a wulsthaube? 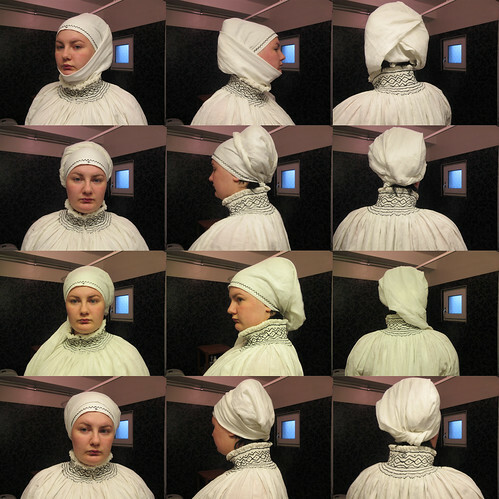 impressive amount of work, admirable passion for accurate period costume!